1) Q: Which of these pictures depicts a narrative? What makes you say that? A: In the Adoration of the Magi, things are happening; figures are gesturing and moving. In Madonna and Child Enthroned, nothing happens; nobody moves; time stands still. 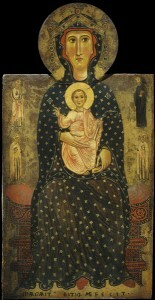 2) Q: Explain that Madonna and Child Enthroned is an icon. Ask students to visually contrast the two paintings, speculating on differences between icon and narratives. A: The discussion may include some of the following contrasts: narrow focus vs. multiple vignettes; stasis vs. action; flat vs. three-dimensional space; linear vs. modeled treatment of form; gold ground vs. sky backdrop; symbolism/abstraction vs. naturalism; heaven vs. earth; ideal vs. real; hieratic structure (the disjunction between the large Madonna/child and the small saints) vs. unified space (all the figures are of the same size, occupying the same space). 3) Q: Visually compare the two paintings. Do you see anything in one painting that also appears in the other? A: Both contain a haloed Madonna and Child in an impressive architectural setting, surrounded by attentive figures. 4) Q: The paintings adopt very different approaches to the depiction of the Madonna and Child. Which do you think results from a humanized (humanist) view of Christianity? What makes you say that? A: Except for the haloes and architectural colonnade, the holy figures resemble and occupy the same space as ordinary mortals. 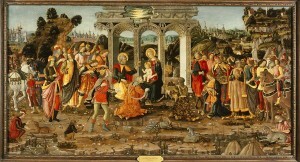 The setting is recognizable as an earthly landscape, and ancillary details (such as the monkey and dogs) add human interest. Details of pose, costume, and facial expression seem calculated to appear lifelike and engage our interest and sympathy.